BONETT. On January 16, at Mater Dei Hospital, PAUL of Floriana, aged 88, passed away peacefully comforted by the rites of Holy Church. Loved and remembered by his sons Pierre and Lijie, Adrian and Eveline, his grandson Nicola Paul, his brothers and sisters and their respective spouses, his in-laws and their families, other relatives and friends. 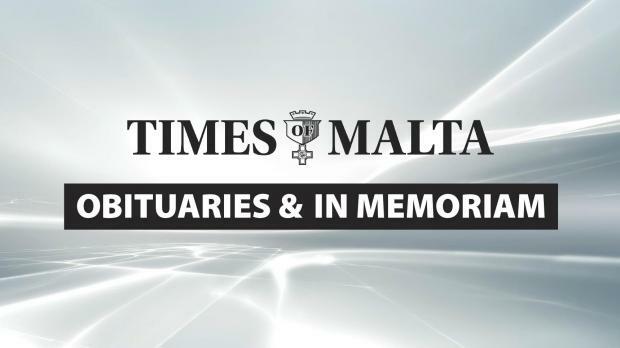 The funeral cortège leaves Mater Dei Hospital on Saturday, January 19, at 8.30am for St Publius parish church, Floriana, where Mass præsente cadavere will be celebrated at 9am, followed by interment in the family grave at Santa Maria Addolorata Cemetery. Lord, grant him eternal rest. FARRUGIA. On January 15, at Mater Dei Hospital, INEZ, aged 91. She leaves to mourn her loss her husband Andrew, her son Emmanuel and his wife Rita, her daughters Maria and her husband Mario, Carmen, Monica and her husband Noel, Phyllis and her husband Andrew, her sister-in-law Leoni Grixti, her grandchildren and their spouses, other relatives and friends. The funeral leaves Mater Dei Hospital tomorrow, Friday, January 18, for St Theresa Sanctuary, Birkirkara, where Mass will be celebrated at 2.30pm, followed by interment in the family grave at Santa Maria Addolorata Cemetery. No flowers by request but donations to Id-Dar tal-Providenza, Siġġiewi, will be appreciated. Lord, grant her eternal rest. MUSCAT. On January 16, at Mater Dei Hospital, ANGIOLINA of Mosta, aged 86, passed away peacefully, comforted by the rites of Holy Church. She leaves to mourn her loss her sister Pauline, her brothers Joseph and his wife Marie Louise and Anthony and his wife Maud, their children Ruth, Sarah, Valerian and Adele, and their families, other relatives and friends. The funeral leaves Mater Dei Hospital on Saturday, January 19, at 8am for Mosta Basilica where Mass præsente cadavere will be said at 8.30am, followed by interment in the family grave at Mosta cemetery. Lord, grant her eternal rest. The family would like to thank the staff at Central Home, Mosta, for the care and dedication shown during her stay there. SALIBA. On January 16, at Mater Dei Hospital, MARIANNE of Żebbuġ, aged 84, passed away peacefully, comforted by the rites of Holy Church. She leaves to mourn her loss, her beloved daughters Bernardette, widow of Martin Dimech and Veronica and her husband Joseph Mifsud, her grandchildren Matthew and his girlfriend Christina, Yanika and her boyfriend Chris, Kim, Davinia and her husband John Wirth and Anthony, and her great-granddaughter Ana; her brothers and sisters Matthew, Irene Cutajar, Frankie, Sammy, Philip, Emmanuel, Joanne Blandino and Raymond and their respective wives and husbands, and widows of her late husband’s brothers, other relatives and friends. The funeral leaves Mater Dei Hospital tomorrow, Friday, January 18, at 2.30pm, for St Philip parish church, Żebbuġ, where Mass præsente cadavere will be said at 3.30pm, followed by interment at the Sacred Heart Cemetery, Żebbuġ. No flowers by request but donations to Dar San Ġuzepp, St Venera, will be greatly appreciated. Lord, grant her eternal rest. SAMMUT. On January 16, at Mater Dei Hospital, MARIA, née Grech, of Lija, widow of Carmelo, aged 96, passed away peacefully comforted by the rites of Holy Church. She leaves to mourn her loss her children John, widower of Annie, Charles and his wife Helen, Victoria and her husband Charles Bonnici and Jane and her husband Mario Cauchi, her sister Lily, her grandchildren, her great-grandchildren their families and friends. The funeral leaves Mater Dei Hospital tomorrow, Friday, January 18, at 2.45pm for Our Saviour parish church, Lija, where Mass præsente cadavere will be said at 3pm followed by interment at Lija cemetery. Lord, grant her eternal rest. BORG – MARY. Treasured memo­ries of a beloved mother, grand­mother and great-grandmother on the 29th anni-versary of her demise. Fondly remembered by her son George, Antoinette and family. CAMILLERI – MICHAEL. On the first anniversary of his passing. A loving and caring husband who is greatly missed by his wife Simone and the family. Lord, grant him eternal rest. FALZON SANT MANDUCA – MARY. In ever loving memory of a beloved mother-in-law and grandmother on the 11th anni-versary of her demise. Sadly missed and forever in our hearts. John, Philip, Julian and Mary Ann. Lord, grant her eternal rest. HUBER. Remembering our dear father JOSIE with fondest love and gratitude. His sons, daughters and their families. PACE – GERALD. In ever loving memory of a beloved and precious husband, father and grandfather on the 37th anni-versary of his meeting with the Lord. Forever in our hearts and prayers, Mary, Joe and Mary Ann, Ingrid and Tony, Liz and Paul and the grandchildren.